Kids getting a good workout on a pump track. Can we get one in Thousand Oaks? See story. 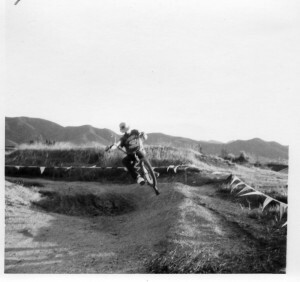 If a demonstrated need in the community is the main criteria for building a bike park (pump track, jumps, skills area), then the City of Thousand Oaks should be at the top of the list. Jumps and mini-pump tracks are all over the place, yet they keep getting bulldozed because the community has not supported the youth who are putting in the effort to do something constructive. THE TIME IS NOW! This is of course my local perspective because I see kids every day on mountain bikes and BMX bikes riding around our neighborhoods, trails, and yes, unauthorized dirt jumps. And I know a lot of parents who’s teenage kids go riding with them. I bet you know people just like that in your neighborhood. The Socal High School Cycling League built a pump track in Riverside recently with CORBA’s help. 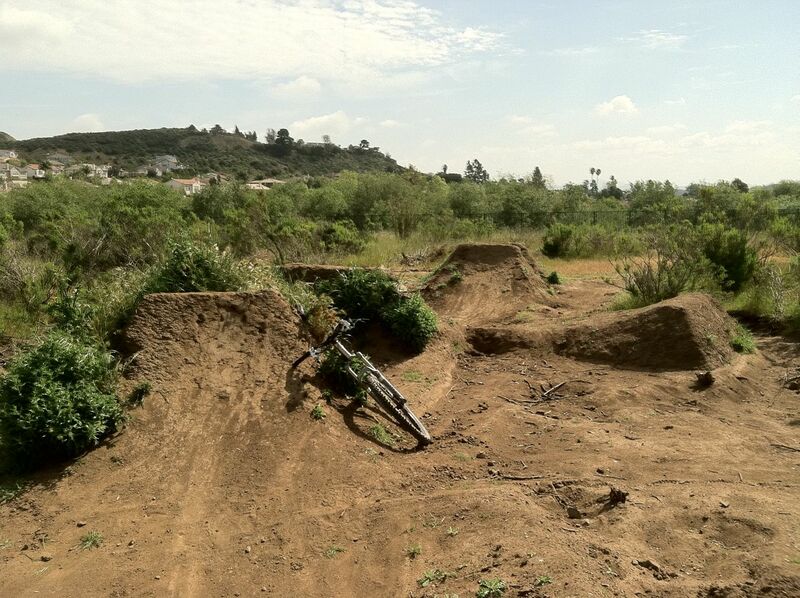 The city of Glendale is considering a bike park and pump track in their trails master plan. There are parks and tracks all over the state. IMBA has had success in several cities including New York, Seattle, and Golden, Colorado. We’re not reinventing the wheel. Click here for the the Bring the Riding To the People project. A bike park can be as simple as a pump track (rollers, bermed turns, table top and gap jumps), but can also include skill test features similar to what might be found on a trail. A supervised environment similar to a skate park, the Conejo Recreation and Park District (CRPD) already has an infrastructure to deal with this kind of facility. 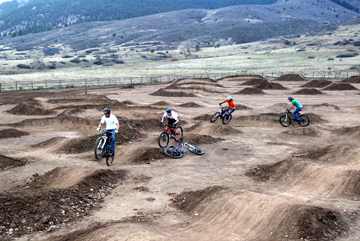 Bike parks encourage volunteerism and stewardship. They provide an area for adult mountain bikers wanting to improve their skills and also help their kids learn, and an athletic/exercise outlet for youth who do not participate in team sports. And they’re just plain fun! Not only that, they do not require the same kind of space, materials, or costs associated with ball fields or other conventional recreational facilities. Watch a video of the Stowe Bike Park pump track in action. Representatives from CORBA have discussed the possibility of a bike park with the CRPD. CRPD managers are amenable to the idea, but stress that the only way something can be done is through community support and commitment. This would require attendance at CRPD board meetings by kids as well as parents and other interested parties to provide testimony and petitions, and other community support (such as bike shops, YMCA, teen centers, schools, etc); not to mention supporting testimony from such organizations as CORBA citing the success of tracks and parks in other cities. This process typically takes 3-5 years, so strong parental involvement is key. Again, CRPD is open to the idea and there are several possible locations, we just need community involvement! We could also use people with expertise in landscape architecture. If you are interested in becoming part of a team to bring a pump track to Thousand Oaks, please get in touch with us at volunteer@corbamtb.com. In late December 2010 CORBA announced it was applying to become a chapter of the International Mountain Bicycling Association. The transformation is now complete, and CORBA is now a Chapter of IMBA. The partnership creates a stronger, unified voice for mountain bikers by linking our data base with IMBA’s, to name but one of several benefits that will enable CORBA to better serve off-road bicyclists in Los Angeles and Ventura Counties and surrounding areas. Becoming an IMBA Chapter affiliate does not change CORBA’s local efforts and relationships with other advocacy groups and land managers. In fact, it will strengthen our efforts. Now when you join CORBA, you will also be getting an IMBA membership as well. And if you join IMBA, you have the opportunity to indicate CORBA as your local affiliate. Join or renew today and help us keep your local trails open to bicycles! April’s CORBA Kids ride welcomed four new riders! Despite record heat two days prior, the weather was cool and comfortable. We had such a successful ride in Cheeseboro that we are going to ride it again next month. Before riding, ride leaders David and Larry introduced themselves to the new riders and briefed the group on trail etiquette, speed control, and described the trail. Don't forget to check out our CORBA store to see our latest additions. These attractive and comfortable jerseys come in two styles, club cut (men's and women's) and freeride (baggy, 3/4 sleeve). Free shipping on all orders has been extended! And don't overlook our new T-shirts, either! Free shipping is extended to June 1, 2011! Five CORBA volunteers and about eight with the Santa Monica Mountains Trails Council (SMMTC) trail crew worked together to clear brush on the section of the Backbone Trail from Latigo Canyon Road west to the bottom of Newton Canyon. The SMMTC crew focused on clearing out the invasive thistle and other low brush while the CORBA crew cut out the higher branches that would slap riders in the body and face as they rode down the trail. View our blog article for the full BBT story, a list of prize winners and the photo gallery. This is a weekend event with CORBA, SMMTC and other trail user groups with camping at Danielson Ranch in Point Mugu State Park. You can come in Friday night and stay until Sunday or leave Saturday after trail maintenance. Some people just come in for Saturday. There will be a dinner and prize giveaway on Saturday evening. 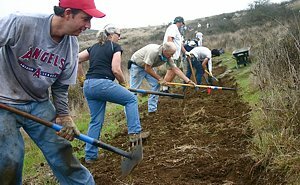 For more details and to register, visit our Santa Monica Mountains Trailwork registration page. The City of Rancho Palos Verdes will be collecting public input at this workshop to prepare recommendations for amendments to the Palos Verdes Nature Preserve Trails Plan. This will include trail use changes and the Filiorum Reserve. The City Council will then consider the recommendations later this summer. 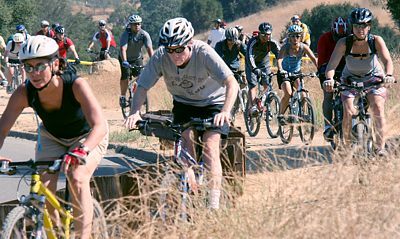 In the past, opponents of off-road bicycling have turned out in large numbers, so it is crucial for lots of cyclists to attend. This is a great opportunity for those who otherwise feel intimidated by public speaking to voice their opinions. Typically, small groups sit at table to discuss topics. No public speaking is needed. See full blog article for more information. Do you want more trails to ride? Do you want to ride trails in the newly created Filiorum Reserve? CORBA PV will be posting recommendations and suggestions soon. Please join the CORBA-Palos Verdes mailing list to keep posted on the latest information. info@mtbpv.org. 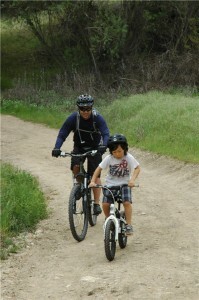 Santa Monica Mountains Trails Days April 29 to May 1 – Join us! Next CORBA Kids Club ride will be Saturday May 7. Details and registration. Next CORBA Meet the Board ride will be Saturday May 7. Details. Next Beginners ride will be Saturday May 21. See our Rides Calendar for details. Saturday May 7th is the next skills clinic.